@keith Gottwald - From my experience, it usually 1-2 days for the order to process, and it takes 3-11 days for the package to arrive. However, there may be a delay due to the holidays (New Years). I have a simple question on the NetGear hotspot device from "FreedomPop Holiday Daily Deals"
I am actually looking for a mobile hotspot device for my friend that will come visiting US a couple month per year. So with this deal I am looking to cancel the plans that come with it immediately then pay for the month only when he is here in the future. Is that possible? If so, what are the current pricing? To clarify, I meant by the current pricing is in regards to upgrade and downgrade when my friend come and go. 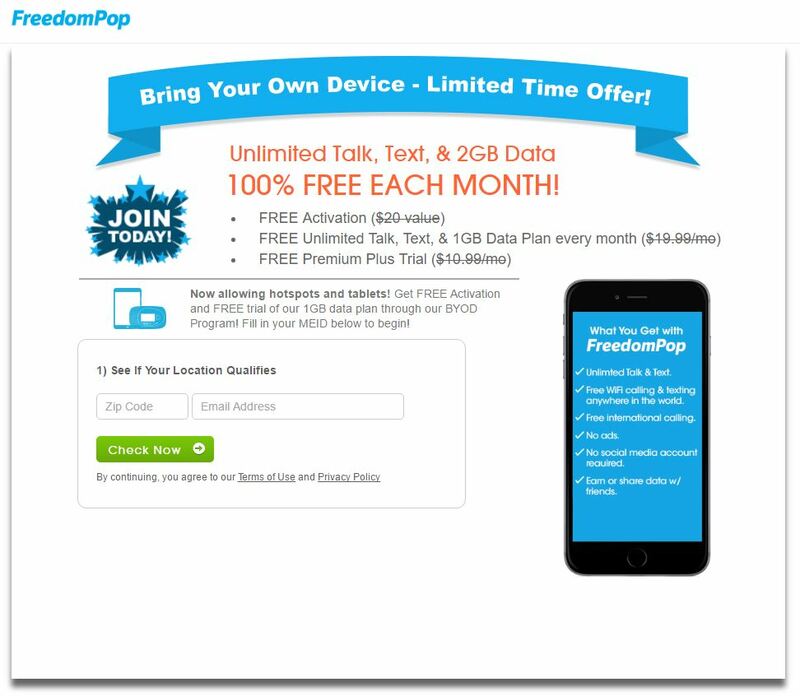 There are a number of people that use FreedomPop as their vacation phone. 11 months of FREE and 1 month of big HONKING paid plan and use the stuffing out of it. Come home and downgrade to FREE for 11 more months. The cost is 1 month of plan. For you it's 2 months out of 12 that are paid. If you get Mingle, Fuse, or MiFi 500 or any but not MiFi 2, all but the one are Sprint based. If Sprint is good in your area, you get more data for the money. Hi. Many deals state that you'll get 500 MB Bonus upon activation today. My question is; will this bonus be given monthly as an extra data? do i lose this bonus when downgrading to the basic plan? Thank you Jorge. I attached a copy of that offer. I'm still wanting to purchase a mobile hotspot from FP but don't want to be shipped a Novatel MiFi 500 again which is what they've shipped me 3 times though I ordered another model. Can anyone from FP verify if either the Netgear Zing or the Sierra Wireless 803s is available and will be shipped to me if that's what I order? When I click on Check Availability on the product page, it pops up with a "checking" box but it never comes back. Thanks for any help. We will further assist you with this on an old PM that we've assisted you on previously! Can someone from FP please explain what you get for free after the trial period if you down grade? It looks like either 1 or 2 gigs of data and not sure about minutes/texts. And is this LTE on Sprint? This plan seems aimed at RingPlus "Refugees". I would like to get on the advertised plan that I signed up for. Can I get some assistance please? That is my question too. This clearly says unlimited talk and text, and 2gb EACH MONTH. This is essentially the same offer that FP made in March 2016. But people who downgrade the above offer are NOT offered what is advertised. I want to sign up... but won't until FP provides what is advertised. We apologize for this inconvenience, I will be sending you both a private message to further take a look into your accounts. We are currently offering a 2GB data trial with our BYOD promotion that you may take a look here. 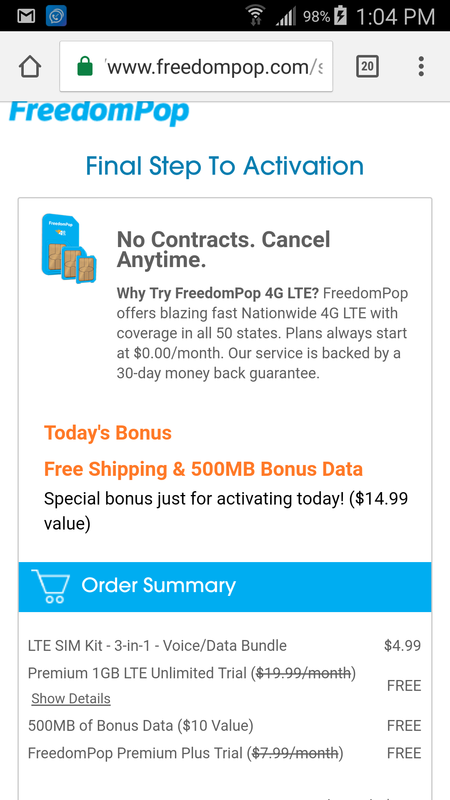 I already have an account with FreedomPop and have scoured their website and have NEVER seen this before. Why is this totally separate from the actual site? I like the deals here but am a little skeptical about it being real. 1. When will the "99¢ global sim/2gb trial" items be back in stock? And if they're out of stock, how come I can order the same sim (minus the extras) for $20 in the shop? 2. If i order the FP global sim on Amazon ($10), will I get the same 2GB free trial and premium service trials upon activating it on the website? 1. Likely a different special will be started when a new BIG batch of SIMs come in for restock. Yes you can order from Shop but likely long delay waiting for more stock. 2. If the Amazon seller says it's included, then yes. Otherwise not. That seller knows of any bonuses and is highly likely to be making it a big bold announcement in his adv. When global sim deal come back? Global sim is better than LTE for me because it is good for travel purpose. Can anyone confirm (either FP rep or from experience) that adding the "additional line" sim would NOT change my primary hotspot plan of 500mb/month free to a 200mb/month plan shared between the new sim and existing hotspot? And if its a new line, with its own 200mb/month, how do I manage those 2 separate lines on my primary email account? thx! Am I correct in thinking this isn't as good as starting a "fresh" account when global sims become available later, since the added line does not have the "fresh account"'s 500mb/month from FP friends and the potential 500mb/month gifted data, but would instead share the existing friends/gifted data? Furthermore, if my primary account is a global hotspot with 500mb/month, does adding this "additional line" then replace that plan with the sim's 200mb/month, thereby making my hotspot (primary acct) and new sim (2nd line) share the 200mb? Or are they somehow separated within the same email/account? ?